#FeelGoodFriday Inspiring stories about the author journey! Let’s give her a big welcome! Her guest interview is below as well as her author contact and buying info! Thanks for sharing with us Maggie your story is fascinating! Thank you, Courtney, for featuring me on your website! I’d like to relate the story of how my first novel, His Kidnapper’s Shoes, came into being. In 2010, fed up with life as an accountant, I quit my job and went travelling for a year. I didn’t tell anyone, but I intended to write a novel along the way, to fulfil a lifelong ambition. And that’s what happened, albeit with a few twists and turns. In hindsight, it’s one of the best decisions I ever made! So what were those twists and turns? For one, procrastination continued to dog my writing ambitions. Two months into my trip, I still hadn’t written a word, mainly because although I yearned to be a novelist, I didn’t know what to write about. That dilemma got sorted during my stay in Vietnam. During a casual conversation, someone said how child abductions aren’t always down to predatory paedophiles; other reasons exist, some of them tragic. This started me thinking, and eventually formed the basis behind His Kidnapper’s Shoes. Although I had the idea, I found it hard to combine travelling with writing. More time passed, and still, I hadn’t penned a single word. One evening, while in the small northern Chile town of Arica, I experienced somewhat of an epiphany. I vowed to travel to my next destination, find a decent hotel, and write every day until I had my long-awaited first draft. I took a bus to Bolivia, enduring a nasty bout of altitude sickness along the way, and ended up in the charming city of Sucre. I began writing in December 2010 and finished His Kidnapper’s Shoes in February 2011. My original intention was to search for a publisher after returning to the UK. That didn’t happen. While in Bolivia I got talking to another traveller, who pointed out the benefits of self-publishing. I checked it out and became convinced this was the way forward for me. I eventually published His Kidnapper’s Shoes in March 2013. The book did well, and I remained happy with my decision to self-publish. In another twist, however, that all changed earlier this year. In February 2016 I received, out of the blue, a call from an acquisitions editor at one of Amazon’s publishing imprints. 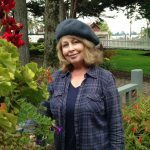 She told me how much she had enjoyed my book, and after a couple more conversations and various emails, Lake Union offered me a contract to republish His Kidnapper’s Shoes along with my next novel, After She’s Gone. After consulting other authors and reading the contract carefully, I decided to accept. So far I’ve had no reason to regret my decision, and I’ve enjoyed working with Amazon! If you’re in the US and you’d like the chance to win one of 100 electronic copies of His Kidnapper’s Shoes, why not enter this Goodreads giveaway? Have your own author story you’d like featured? Please type it up and send it to info[at]fiction-atlas.com. All stories are posted in the order that they are received! Please be sure to include any links you want to have featured with your story.